How can the immune system be strengthened even further? Kitchen appliances for healthy eating: mixer for fresh smoothies, grater for crudite´s, steamer for the gentle preparation of vegetables and a juicer for fresh fruit and vegetable juices. You’ve done a lot for your immune system, if you take in a freshly in a juicer or mixer prepared vegetable juice or a green smoothie, and in return waive the widespread breakfast with coffee, bread, cake, butter, sausage, egg and jam. For the vegetable juice use for example, apples, pears, red beets, carrots, parsnips, broccoli, turnip and other cruciferous vegetables. For the smoothie even collected wild herbs (e.g. stinging nettle, young dandelion, clover, buckhorn, buttercup, young sorrel, ground ivy, daisies, garlic mustard, yarrow, balsam flowers, leaves and fruit from strawberries, blackberries, raspberries…), broccoli sprout, salad, linseed oil, walnut oil and avocado. 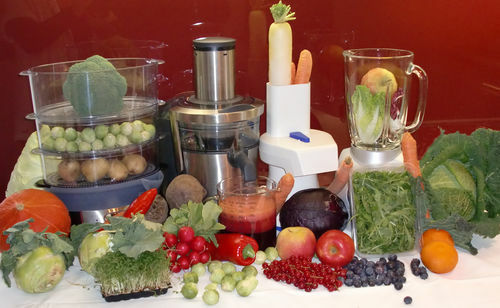 Many variations and mixtures between vegetable juices and smoothies are possible. When preparing smoothies with self-collected wild herbs you kill two birds with one stone: you exercise in fresh air (vitamin D, stress compensation, anti-depressive) and your body gets concentrated bioactive plant compounds, vitamins and minerals to strengthen the body’s defense.